"I hope you find your peace..."
It has been weeks since I watched the Grammy Awards on television. 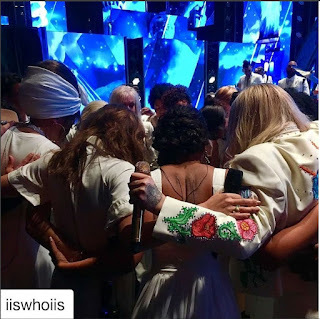 Ever since that night, one performance has stuck with me, autoplay in my head - Kesha's soul wrenching version of her hit, Praying, surrounded by the likes of Cyndi Lauper. As she performed, you could *feel* her emotions. This isn't going to be a post about the #MeToo movement. It is about women coming together to support each other. I'm tired of watching women tear each other down, in the workplace or in public. I'm tired of watching women behave in all manners of cruelty to one another, especially at work. Maybe as women, we were conditioned by watching Mean Girls one too many times. I had a boss once that was so hell bent on proving to the men in the office that she was good enough to be there, that she made the lives of her staff awful. She was more demanding of any woman that walked through the door than any man. She said we, as women, had to work harder to show the world we deserved to be there. If you weren't up to her standard, as a woman, she would use all of her office might to crush you. What a flaming pile of poo emoji piece of advice that was. A better piece of advice is "be nice." Help one another out. Stop with the snide comments and thinly veiled sarcasm disguised as humor. It doesn't take any more effort to help someone up as it does to hold them down. So, why do we hold each other down? Does it improve our status in the office? Are we trying to fit in? We all have our own baggage that we carry every day. Some days, we manage our load easier than others. Our baggage is light and out of mind, like a claim ticket..."I'll pick that up later. Out of sight, out of mind" Other days, our baggage is almost too much to bear. Carrying it all alone, that bag that is too heavy, the strap cutting into your shoulder as you drag it along. You don't really know what the person next to you is going through, personally or professionally. For a change, why don't we use our powers for good and support the person next to us instead of cutting them down. Who knows...we might be on to something.